QuickTimeª is needed to see the image. "Demi" is a french word means half. Around 1960's in Japan, the half-frame 35mm camera got high popularity with the appearance of Olympus Pen in September, 1959. And Canon as well undertook to develop a sophisticated, easy operating, and handy half-frame 35mm camera then. 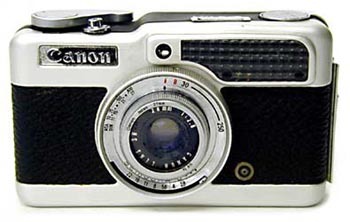 After four years from Olympus Pen had been first introduced, Canon Demi came on the market in 1963. This camera was equipped with high-brilliancy real-image finder, the fast 28mm f/2.8 of four-group, five-element lens, behind-the-lens shutter with light value program, and besides, follow-the-needle type built-in selenium meter. As soon as it was appeared on the market, it got a high reputation because its appearance was a sort of cute, which might bring you to want to carry with it in your pocket while the camera was high performance and function. In addition, the material of body cover was changed from brass to alloyed aluminum on Demi II. Well then, let's take a look at it. Flash sync contact : X sync. Closest focusing distance : 0.5 m.
Body weight : 380 g.